We sell quality lawn mowers, lawn tractors, zero turn lawn mowers, power washers, log splitters, portable generators, and Stihl products. We provide expert service on all makes and models of gasoline powered lawn mowers and equipment. Aberdeen Outdoor Power Equipment will help you select the right outdoor power equipment for your needs, show you how to use it, and be there when you need service or repair. Our Store is located on the westbound lane of RT 40 right next to Canby Motors Collision Repair and across route 40 from Chesapeake Autos. Anytime during regular hours. After hours leave your phone # and message. We’ll get back to you within 24 hours. Info@aberdeenoutdoor.com Have a simple question or need general information? We’ll get back to you within 24 hours. 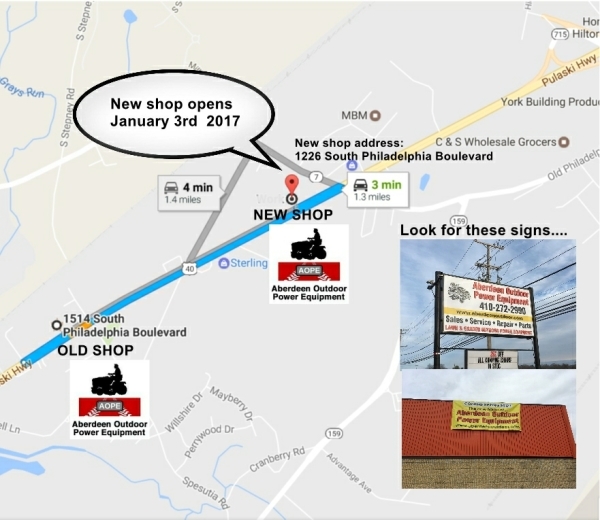 Our store and shop are located on Rt 40 in Aberdeen, MD at 1226 S. Philadelphia Blvd in the old Pioneer Outdoor Building. We're a local company built on delivering dependable repairs and affordable service. We know lawn mowers and small engines. We service them on premises in our modern shop by mechanics with decades of experience. At Aberdeen Outdoor you'll always get a fair shake, but we also have some great seasonal deals. Interested in the details? Service and repairs you can trust. Our service technicans are factory trained and certified. Your service or repair will be done right - guaranteed! Servicing customers for over 25 yrs. Dealer for several major manufacturers. Modern and fully equipped shop. Extensive OEM and after market parts inventory. No extra charge for ordering parts not stocked. Service and repair on most major lawn mower brands including those sold at Home Depot, Lowes, Tractor Supply and Sears. You can drop off your equipment anytime we're open. 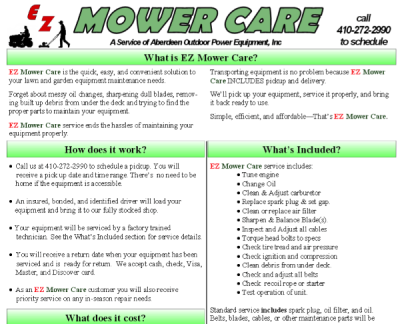 call 410-272-2990 or schedule using the button below.